Hot off a continuously successful festival season, relentless Paper Diamond is once again hitting the road on his headling Night Vision Tour 2012. Be sure to catch this progressive and thrilling producer and DJ as he makes his way across the expanse of the US. Paper Diamond will also return his hometown state's Ogden Theater in Denver on September 19 for what is sure to be a massive night. He'll be supported by Crizzly and more artists TBA. The Colorado native has an extensive background in making beats that are a blend of hip-hop, bass music, and electro, all with a whiff of ganja smoke blowing through it. He has a kind of raw energy and dramatic anticipation that only a seasoned producer can incite. His signature driving beats and bass grab onto you while deep, rich tones rumble under layers of spacey synthesizers, sweet melodies, and catchy vocals. He'll be supported on select dates by Eliot Lipp, The Knocks (DJ Set), Crizzly, Clicks & Whistles, and Morris. Each of these artists, in their own unique way, represent a raw, cutting edge sound that is a combination of dubstep, hip-hop, jazz, and house that takes electronic music to a whole new level. Paper Diamond recently joined Diplo's Mad Decent label, with his brand of music fitting in nicely with his new label mates Major Lazer, Crookers and Rusko, among many others. His new EP entitled Wavesight was released May 3, and showcases Paper Diamond's talent for incredible bass, electronic, and hip-hop styles. The EP features three heavy hitting original tracks that further demonstrate Paper Diamond's musical versatility. Keep a look out for Paper Diamond's next EP, which is currently in the works and expected sometime this fall. MTV recently premiered the video for "Turn the Lights Off," featuring a collaboration with New Orleans based singer songwriter Nasimiyu. Check out the video HERE. Additionally, his remix of Usher's "Climax" recently premiered on RCRD LBL HERE, and his track "Time Flies feat. Russ P" was premiered on Jay-Z's Life + Times HERE. 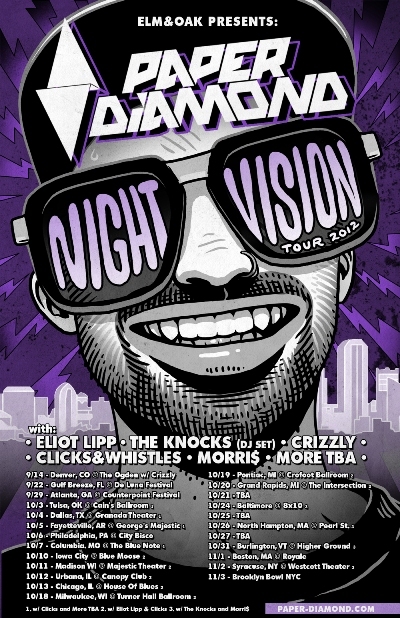 Paper Diamond's Night Vision Tour will hit major cities across America throughout fall. He will be stopping by Dallas, Philadelphia, Madison, Baltimore, Portland, Boston, Brooklyn, and more. He will also be playing a special set in Chicago to make up for his Lollapalooza set that was cancelled due to a storm.